One of the more well-recognized Now-Casting data series is the GDPNow series produced by the Federal Reserve of Atlanta. 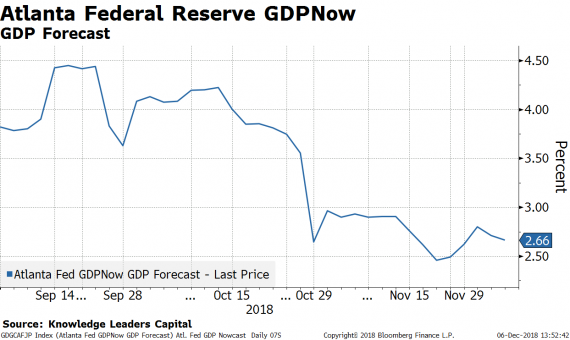 Every day they incorporate economic data releases and update their estimate for GDP growth in the current quarter. 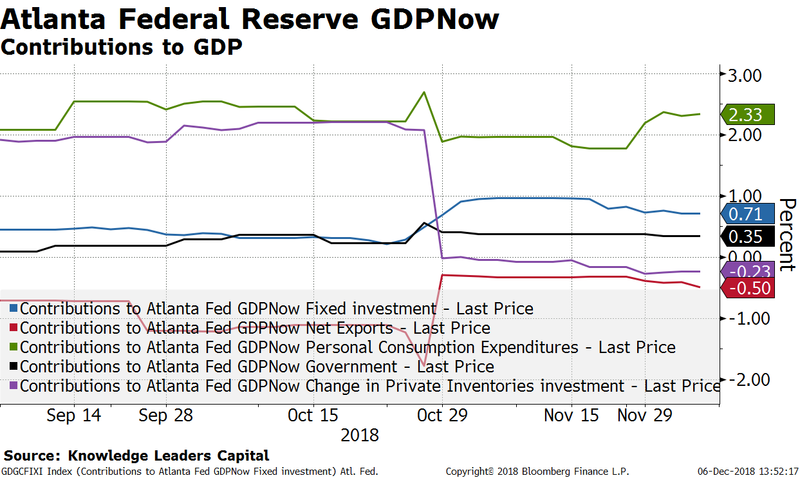 GDPNow is a great source of information on the real-time performance of the US economy. Growth expectations, after bouncing from November 20 through December 3, are again fading. Fourth quarter growth estimates peaked at 2.8% and have retreated to 2.66% as of today. The most likely explanation is the continued tightening of financial conditions. 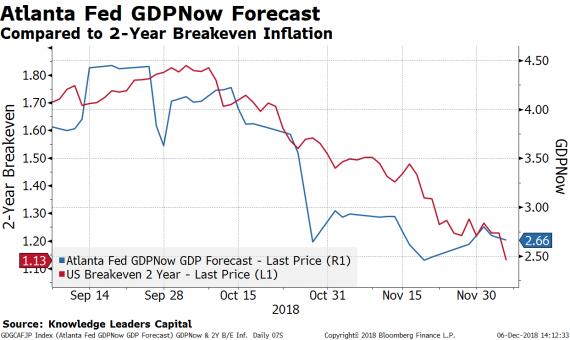 In this next chart, I overlay the Bloomberg Financial Conditions Index on the GDPNow Forecast. In the last week, as financial conditions deteriorated further, growth estimates slumped. The contribution to growth from personal consumption has actually picked up by about 40bps in the last few weeks. The contribution to growth from net exports and inventories will be negative. 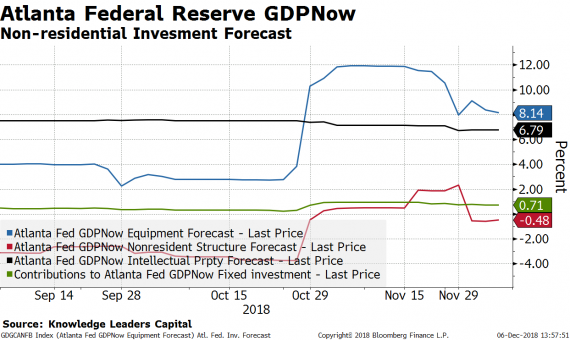 The contribution from fixed investment has dropped by about 30bps in recent weeks. Part of the drop in the fixed investment contribution is a slowdown in the expected growth rate of capital spending on equipment. This probably is being influenced by the decline in oil prices and trade concerns. But the most concerning aspect of growth is residential fixed investment. 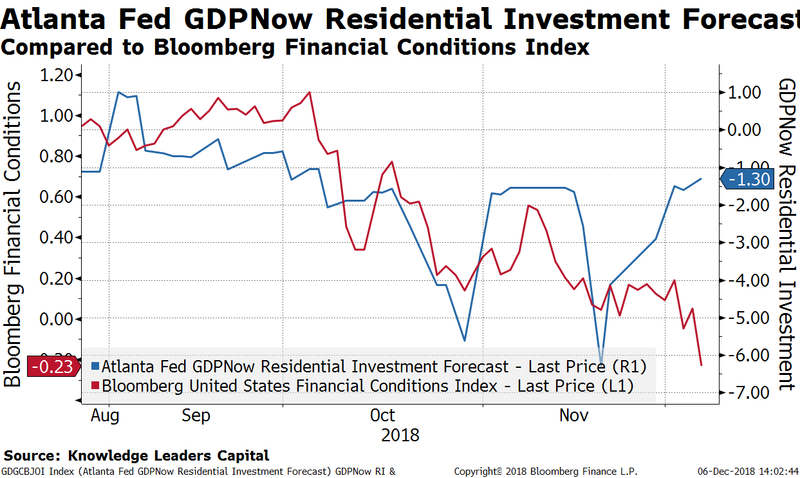 While residential investment growth has improved over the last few weeks, I am not sure it will last as financial conditions continue to tighten. 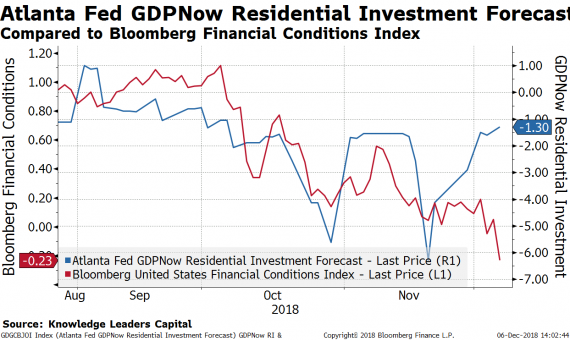 In the next chart, I overlay the expected growth rate of residential fixed investment on the Bloomberg Financial Conditions Index. The step lower in financial conditions suggests a big risk that the next data points on housing may not be good. Bloomberg breaks out six categories when measuring economic surprises, captured in the graph below. 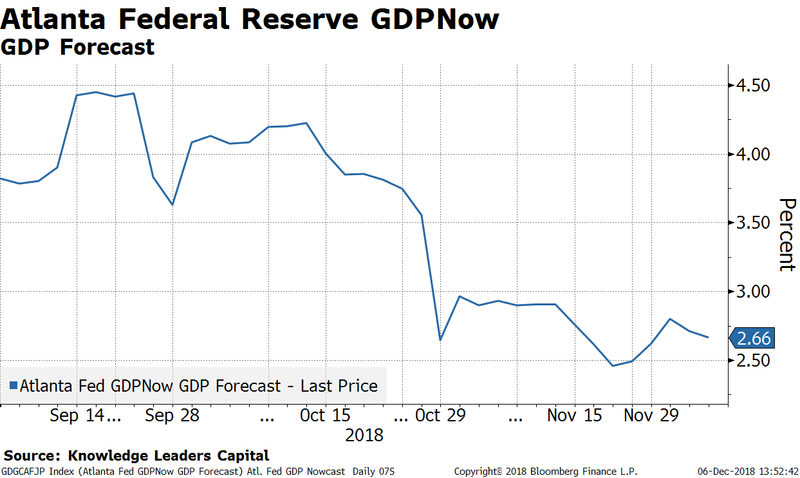 This is an easy snapshot to see which areas of the economy are coming in stronger than expected and which are coming in weaker than expected. 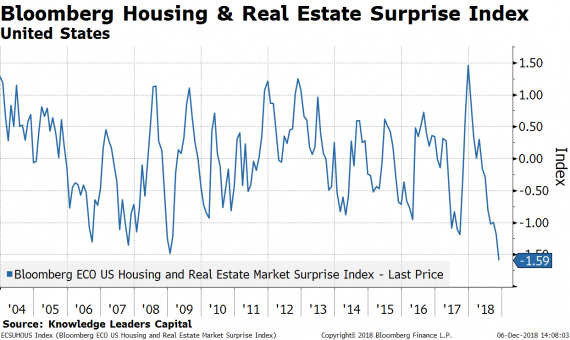 Clearly, housing and real estate has been the biggest drag on economic surprises lately. In fact, the Bloomberg Housing and Real Estate Surprise Index, looking at monthly readings going back 15 years, is the weakest in history. 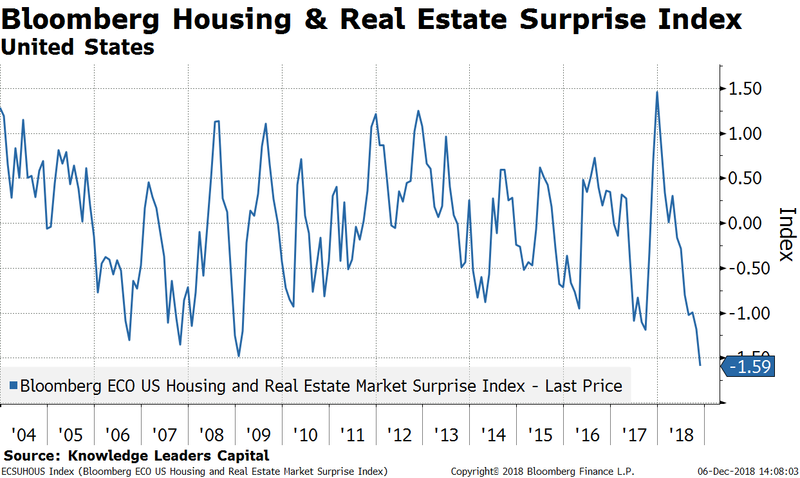 Housing-related economic surprises are worse now than January 2009 if you can believe that. The bond market appears to be projecting further weakness for 4Q growth readings as well. 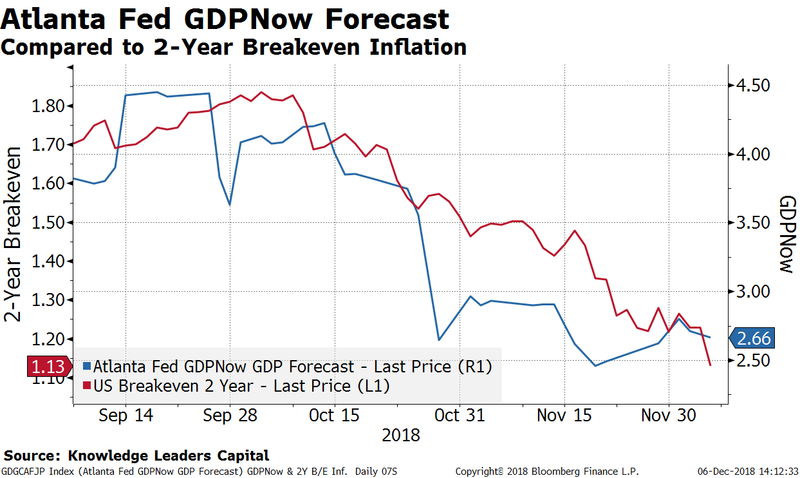 The last leg lower in the 2-Year US Treasury breakeven rate suggests investors are discounting a further slowing of growth. 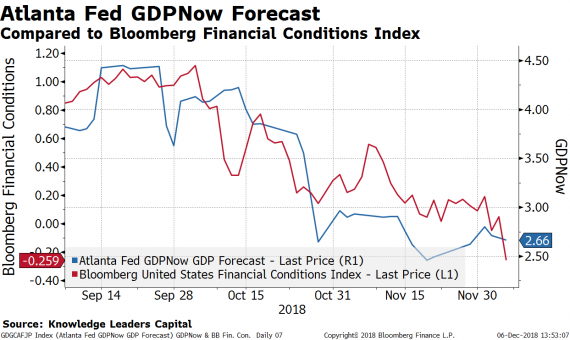 So, the prognosis for growth in the final quarter of 2018 is not looking great based on the tightening of financial conditions. The tightening of financial conditions recently has been mostly a function of the widening in corporate bond spreads, which is ongoing. But, the latest negative contributors to financial conditions are equity volatility and the S&P 500. 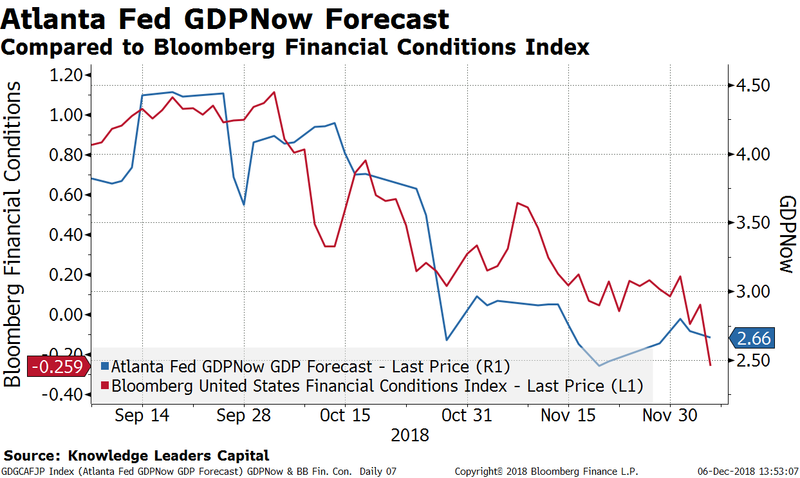 As stocks sink and volatility rises, this could drive another leg lower in financial conditions which in turn could drive 4Q growth estimates one step lower too.